Garrett Scott isn’t impressed by life in general and by his new middle school in particular. Then Elizabeth Conner, the prettiest girl who’s ever smiled at him, tells him about The Book of Squires. 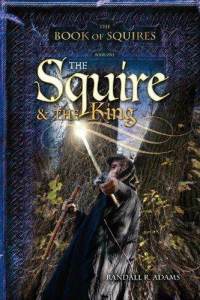 Book 1 in The Book of Squires fantasy series by Randall R. Adams. Only those who survive the Testing will become squires in the service of the King. Garrett Scott isn’t impressed by life in general and by his new middle school in particular. Only a few weeks ago, he’d been a student at the renowned Hightower Preparatory Academy in Highland’s Gate, a wealthy and powerful city far to the north. Now he’s stuck in Melas, a flea speck of a village…and, once again, he’s the outsider. Then Elizabeth Conner, the prettiest girl who’s ever smiled at him, tells him about The Book of Squires, which records the Kingdom’s history from the beginning until the very end of time, and also about the great King who selects children in their seventh year of school to become squires-knights-in-training. Garrett’s been told the stories are all fairytales for gullible children. But he can’t help daydreaming about the possibilities. What if the stories are true?